Think about all the things you did in 2011 that you hadn’t done in 2010: maybe sharing random songs you’ve been listening to with your friends, checking in a TV show, buying an e-book or even publishing one… This year has been very busy on the media front, and here are the main trends that have been transforming news and entertainment over the last months. In 2011, we’ve learned that social networks, especially Facebook, could be key traffic drivers for news websites. But what’s even more interesting is that Facebook is becoming a news destination of its own, where people discover articles their friends have shared. This is also something Mark Zuckerberg actively encourages, and his company has partnered with many of the world’s most popular media outlets. The Guardian’s Facebook app is one of its results, and was installed by 4 million users in only 2 months. More generally, every single type of media, from music to movies and TV, has increasingly become a social experience over the last year – a trend which Facebook leads and illustrates well. Thanks to its partnership with the music streaming service Spotify, users can now share what they’re listening to very easily, giving the social network more of the “frictionless” data it’s eager to get. As for Spotify, it quickly gained 1m new users from the integration. Combined with the effects of its international expansion, this helped it reach 2.5m paying subscribers last month. Besides news and music, video is also increasingly social, including Facebook, where people can watch movies and interact with TV shows. One of the best examples of this convergence is The X Factor: not only can Facebook users directly vote for their favorite contestant through the social network, they can do so by using Facebook Credits. It’s not just about Facebook: many dedicated film & TV-related apps have emerged, that let us share what we’re doing, for instance by doing a “check-in” for a TV show. This also goes beyond check-ins; as we recently reported, the battle for social video is stirring up, with players such as Miso and Zeebox competing for our attention on a second screen. With so many distractions and so much multi-tasking, you may think there’s no space for demanding content; but 2011 has proven it’s wrong. Many apps have emerged that let us save an article and “read it later” – showing there’s no contradiction after all between browsing news on a mobile device and finding time for long reads. If you needed one more sign that the opposition between short and long-form content is overrated, Twitter users have also being pushing articles which are much, much longer than 140 characters thanks to the hashtag #longreads. Beyond long articles, this trend also extended to e-books. As Andrew Lipsman from comScore recently noted, “people are downloading e-books in a way they had not previously.” Figures also reflect this surge, and Amazon announced in May that it was now selling more e-books than paperbacks and hardbacks combined. This is not just about purchases: lending and borrowing e-books is now more and more common. We can exchange e-books with our friends, for instance through Lendlink or via the newly created ‘Kindle Lending Club‘ on Facebook. In the same way we can go to the library to borrow a printed book, US Kindle owners can also get access to e-books thanks to a partnership between Amazon and a whopping 11,000 libraries across the US. What the interest for long reads reflects is an even more interesting fact: readers are looking for quality content, as long as it’s easy to find. The decline in traffic towards content farms is the proof of it: their readership steeply declined as soon as their low-quality posts stopped ranking high in search results thanks to Google’s new algorithm. Simplicity is a key element here. While some users are prepared to handpick hundred of feeds to customize Google Reader, most people prefer passive personalization, a report revealed. In other words, many readers want their content to be curated for them, which explains the huge success of personal magazines such as Flipboard and the like. The success of e-books and long-form content is inseparable from the boom of tablets – not only the pricey and highly desirable iPad, but also less expensive competitors, particularly Barnes & Noble’s Nook tablet and the Kindle Fire (see our review). E-readers are also boosted by lower price tags, starting from $79. All combined, Amazon sold 1 million Kindles per week during the first three weeks of December, which is set to further boost sales of digital goods in 2012. 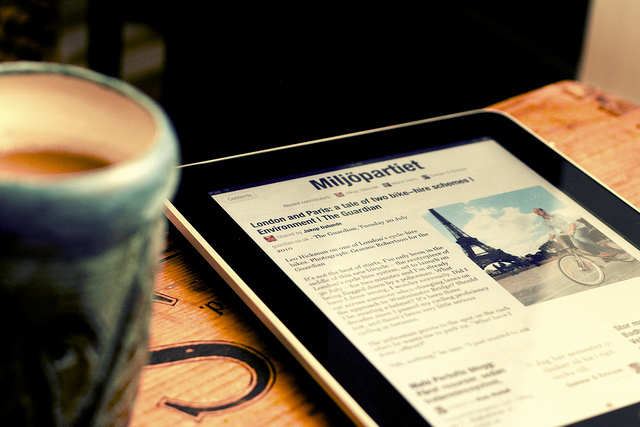 As a result of their huge popularity, media outlets have tried to adapt to tablets. One of the most telling examples is The Daily, which News Corp created as a paid iPad newspaper. However, it seems we weren’t the only ones to be underwhelmed, and it seems to have been a loss leader for Rupert Murdoch so far. Instead of developing brand new content for the iPad, other players have been working on adapting existing sites to the tablet. Many opted for the app approach, such as Google Currents, while others, such as OnSwipe, preferred a browser-based vision. What they all have in common is their ambition to make content easy to browse, just in the same way we would read a magazine in our living room. Mobile devices aren’t the only drivers of this move towards our living rooms. Our TV sets are also more and more often a gateway to hours of media content, through game consoles, set-top boxes or simply smart TVs. Microsoft XBox’s owners, for its instance, have access to the BBC, HBO and YouTube on their TV; gaming is only one of the many entertainment options it now offers. Overall, video streaming on game consoles is up 7% year-on-year, Nielsen recently reported. As for connected TVs, while the Google TV hasn’t become mainstream yet, its lean-back interface, and that of YouTube, give a good idea of the direction the market is taking. One of the most interesting consequences of digital content is that the barriers to get published are much lower. This is true for small organizations and blogs, which can publish Kindle Singles and find a new way to monetize their content. This is also true for individuals, who can now self-publish e-books and get a larger share of the pie. Self-publishing is also something Amazon encourages, and the company created a $6m fund for independent authors and publishers. Still, launching a book usually requires promotion – unless you’re J.K. Rowling – and new players have emerged (‘estributors’) to help authors promote their digital work. This disintermediation is even more obvious when it comes to news. Journalists are becoming brands, sometimes more popular on Twitter than the media outlets they work for. Their mission is also changing, giving more importance to real-time reporting, breaking news and curation. Not only have journalists been live-streaming major events all year, they have also integrated external content to their reporting quite often, for instance thanks to Storify. This external content, most of the times, was coming from non-professional sources such as activists are simple citizens, reporting on the events they were witnessing. Many tools make it much easier for anyone to become a reporter, starting with Twitter, which many used to break news around uprisings across the Arab world, for instance in Tunisia and in Egypt. Besides text and voice messages, many of these contributions were videos, something a platform such as Bambuser greatly facilitates. These tools have become a target for repression, as local authorities tried to block services such as Twitter, which led the startup to stand up for freedom of expression in a blog post titled ‘The Tweets Must Flow‘ and co-written by Biz Stone. However, authoritarian regimes aren’t the only ones that have tried to put pressure on Twitter; so has the US Department of Justice, in an attempt to get information on WikiLeaks activists. Beyond its revelations before it suspended publishing, the whole WikiLeaks story was fascinating to follow from a media perspective. It was quite interesting to see how the traditional media would work with someone like Julian Assange; unsurprisingly, it didn’t go too well, with Assange cutting all ties to the Guardian earlier this year. While most of the rift between WikiLeaks and the Guardian revolved around ethics, with the Guardian accusing Assange of not caring for people’s safety, some traditional media outlets have no lessons to give on that matter. The phone hacking scandal killed News of The World, it also crossed the Atlantic, and we still haven’t taken the entire measure of the consequences it will have on Murdoch’s empire. One thing is for sure: it also damaged the traditional media’s credibility, which was the last thing it needed, in a year in which print media has clearly declined in the US (see this infographic). This led to newsroom job cuts, including at prestigious newspapers such as The New York Times. Things aren’t all rosy in the digital world either; while the Huffington Post still managed to expand abroad and hit 1 billion pageviews after its acquisition by AOL, the group’s other buys didn’t go as smoothly. It led to a series of high profile resignations amid criticism of “the AOL way“. However, some players have had more success. This is the case of The Atlantic, with digital ad revenues that exceeded print revenues for the first time this year. The traditional magazine isn’t the only one who found a way to monetize its content online. So have many media outlets which have implemented paywalls this year. To the surprise of many analysts, these paywalls turned out to have less impact on readership than expected. Yet, online news monetization is still very much a work in progress. Google, for instance, has been conducting experiments around its promising One Pass project, such as a system which let users pay with an answer to a survey. In other words, the future of news is still to be invented, with a series of initiatives to fund innovative media forms. It also remains to be seen how each type of players will share revenues; Apple, for instance, has been trying hard to get a cut of subscription fees through iOS devices, a demand that publishers question. The Financial Times could even open the way to a different model; it decided to dodge Apple’s walled garden with a Web app which turned out to be highly successful. Video on demand is another segment which still has a long way to go. Smaller players like UK’s SeeSaw ceased operations, and even big name Netflix had serious problems in its domestic market. While these were largely due to strategy mistakes, some issues are inherent to the nature of online media. Licensing content is expensive, which means that Netflix’s international expansion, for instance, can’t be as quick as its shareholders may wish. Doing business with studios also takes time, and the long-awaited UltraViolet digital locker still has to expand beyond the US and the UK, where it launched recently. Music offers in the cloud are only just starting as well; while Apple’s iTunes Match is now available in several countries, Google Music is only available in the US. Bringing the startup approach to media? While working with Hollywood studios isn’t always easy, the entertainment sector could greatly benefit from the startup culture. Doing things differently can pay, and Louis C.K.’s highly successful comedy stand-up special is the proof of it. Could tech approach and innovations contribute to democratize Hollywood in 2012? We’d certainly love to see this. You can find the whole of our Tech Rewind 2011 series collected here.